Kansas Wheat Alliance (KWA) offers several K-State wheat varieties that can perform in any environment, for any type of producer. Great disease packages, drought resistance, acid soil tolerance and high yields are various aspects delivered in KWA varieties. Even with many tribulations during the 2018 growing season due to drought and other weather conditions, KWA varieties still made it to the top of many performance tests across and outside Kansas. One of KWA’s highest performing varieties this year and past years is Larry, a hard red winter wheat with high performance especially in the south central region of the state. “If we look at south central Kansas from McPherson through Hutchinson and as far south as Conway Springs, and we look at harvest results from years 2015 to 2018, Larry was the highest yielding variety in south central Kansas, together with WB4303,” said Romulo Lollato, wheat and forage crop extension agent with K-State. In that same region, Zenda, another hard red winter wheat variety from KWA, also ranked high on the list, especially in 2017. “These are excellent results. We’re comparing with several other varieties, including private and other public varieties as well,” Lollato said. Results like this are expected because of Larry’s higher yield potential compared to Zenda, but Zenda has other attributes that make it a very successful variety. Ultimately, these top two yielding varieties are very different, but both provide great results. “That’s why we suggest that a wheat producer should always diversify their varieties within their operation. Depending on the region, you may have drought stress or acid soils more often, head scab, or whatever your problem is, but you should be really trying to diversify your portfolio of varieties,” says Lollato. Zenda has been called the “Everest replacement” due to its similarities with the well-known, older variety. It has the strengths of Everest but has better milling and baking qualities. “Zenda brings forward a lot of the resistance to fusarium head blight (FHB) and some good resistance to barley yellow dwarf (BYD). It also addresses the Everest vulnerability to stripe rust, and that’s a big plus in some of those heavier stripe rust years,” said Erick DeWolf, K-State wheat disease specialist. Zenda, like Everest, offers FHB tolerance, which makes it a good choice if you are going to plant it following corn. Its scab tolerance and good stripe rust tolerance make Zenda a great fit for a producer’s operation. DeWolf says that if Everest has done well for you, then Zenda would be a more productive, stripe rust-resistant variety that is worth a look. 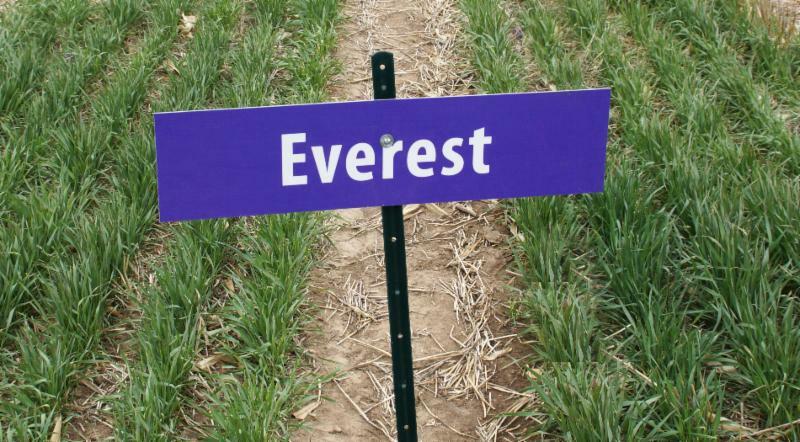 Everest is one of KWA’s most well-known varieties and has been a top performer in Kansas for a number of years. DeWolf says Everest offers a great disease package that has remained strong over its lifetime, even in difficult disease years. “Some of its strengths have been some of the best available resistance to fusarium head blight, barley yellow dwarf, leaf rust, powdery mildew, and it has Hessian fly resistance. That disease resistance has really helped it maintain its productivity in a lot of years,” De Wolf says. Everest is best adapted for central and eastern Kansas, where many of the diseases mentioned by DeWolf are most problematic. Its replacement, Zenda, offers an improved quality profile as compared to Everest. Two varieties that are performing well in the western part of the state are Tatanka, a hard red winter wheat, and Joe, a hard white wheat. Tatanka offers good stripe and stem rust resistance, plus a resistance to soilborne mosaic. DeWolf says the rust resistance is important for western Kansas and so is its average drought tolerance. Another notable trait Tatanka offers is a high yield performance. In the 2018 K-State Wheat Performance Tests, Tatanka was in the top yielding group in Tribune and Decatur and was the top yielding variety in Larned. Joe is a strong, hard white winter wheat option for western Kansas. It has had an exceptional yield record in recent years, and DeWolf says it’s one of the best adapted and most productive varieties that is available for growers in western Kansas. Joe also offers an above average disease package with resistance to stripe rust and leaf rust. Perhaps most notably, it also has some of the best available resistance to the wheat streak mosaic virus (WSMV). Another KWA variety well-suited for the western part of the state is Oakley CL, a hard red winter wheat, which also has good resistance to WSMV. It is also strong on stripe rust resistance and is moderately resistant to leaf rust. “When growers know they are in a high-risk area for wheat streak and want to plant a red wheat then Oakley CL is often what we direct them to because of its resistance to wheat streak mosaic,” DeWolf said. DeWolf says the wheat streak resistance is not a silver bullet, though, and growers should be aware that the resistance doesn’t function at very warm temperatures. KWA offers a number of other varieties with various traits to make them successful. It’s important to remember that each variety offers something a little different, and it’s good to diversify your wheat variety portfolio to make sure you are not exposed to one specific problem. If you are interested in learning more about K-State wheat varieties, visit the KWA website at kswheatalliance.org to find information on where to buy and variety performance in your region.